OK- I have to give some serious props to EVERYONE involved with GSAPC. I have always tried and tried to get more young people to support Tulane. And, of course, my best friends were ARE those that shared my same passion throughout all of college. We were those kids every game - the only ones in the student section. After 4 years of trying to beef up the student section and one year being a graduate and trying to resist going to the student section... on May 18, 2013 I took a weekend trip to Mobile with 5 of my best friends, where we finally decided to take some action and put our shenanigans into some sort of organized fashion. It began just us 6, with the help of a few other friends, calling ourselves a club and making everything we did an "official event" After a few meetings with others in the Tulane community, teaming up with the wonderful folks of the Tulane Alumni Association and taking some expert advice from Mrs. Hullabaloo, we've started to get the hang of this.Now we have over 60 members, Gumby swag, and sub-krewes. That means we're successful, right? We're gettin' there, y'all, and I get more and more pumped up with every GSAPC meeting. And just for the record, our events are extending beyond just tailgating (running club, yoga club, outreach club) and we will even be incorporating some "social aid"! Prepping: I had such mixed emotions getting ready for the big day. Half of me was wanting to spend all day Friday cooking some sort of themed food and snacks, putting together the best game day outfit, and digging out some face tattoos. Half of me was frantic about figuring out where to park and trying to help my grandpaw find a good spot that wasn't too far away. I was too excited to concentrate or worry about anything, but stressed out at the same time. It was a weird feeling. Thanks to Jeff working out some great plans with TAA, we had a tailgate plan. Thanks to Asyl's brother, I knew where I was parking. Thanks to my restlessness and my kitchen, I made some pretty good honey bbq chicken sliders to share. And thanks to Elios and Alex, we had a keg of green beer lined up. 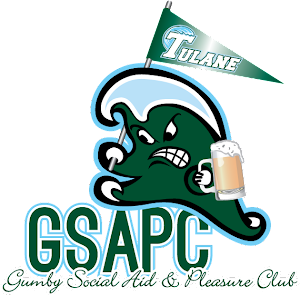 Tailgating: I was sporting a "Party Like it's 1974 Tee" from Campus Connection and a sweet Tulane fedora that I successfully bid on at the Greenie Gals Tee. My fam was there of course! My best college friends were there. We had a prime location. It looked pretty outside, but it was hot as hell. I didn't mind the sweat. I was very impressed with the tailgate village and blown away by the crowd of greenies. After soaking it in, visiting with fellow alumni that I hadn't seen in a while, playing some drinking games, and singing the fight song with the band, it was all of a sudden time to go! Frustration: Ok, fast forward like an hour - I missed kick off. NOT GOOD. I'm pretty sure that's why we lost. I mean, it's bad luck to miss kick off. I had gotten a couple extra tickets at the last minute for my parents, so we had to go grab them before heading in. There were only 2 windows open and TONS of people waiting... I do not understand why we couldn't have more windows open. Every article I read advertised that it was a sold out game. I work in the business of ticket sales and service... if the game is sold out, you typically have the box office prepared with staffing to handle a big crowd... Anyways, I got the tickets and moved on to the next line to get in. A little long, but not terrible. Once we got in, after stopping and staring in disbelief that I was actually in Yulman stadium, I started to panic. I"m not sure what was going on but it looked like the marching band was walking across the concourse to get into their section - I guess I just missed their pre-game show - but the shoulder to shoulder crowd making their way down the concourse was NOT moving. This stressed me beyond belief because, like I said, it's bad luck to miss kick off!! Finally: I get to my seats and forget my problems. Wow, what a sight. Looking at the field and just thinking, this is our field. This is our stadium.. this is Tulane..this is real... The student section is packed!? The heat: Yea, the heat was miserable. But hey, it's Louisiana, y'all. I'm hesitant to complain because the LSU fans may say something like I'm weak... whatever. For a hot second I missed the A/C of the Dome. No- that's definitely a lie. I'll take the heat. Too bad we lost to Georgia Tech - yea, I expected that. That's all I'll say about that. BUT GSAPC GOT 15 NEW MEMBERS! Yeah! 15 new members from our first tailgate! Now THAT's a success. We MUST be doing something right.. another toast, please!! Confused Southeasterners at the Gumby Tailgate after a TU-SELU flip cup challenge. The tailgate was successful all over again. Not as many new members, but LOTS of GSAPC t-shirts that came back for the fun! In fact, when I was walking over to the Alumni House with a case of Bud Light on my back, I saw a gal biking by in a gumby shirt and, this may sound weird, but I was SO EXCITED because I didn't know her. (Now I do.We flip cupped it out.) How cool is it that our gumby spirit is spreading? I know what y'all are thinking... wow you are just talkin up your club's tailgates over here, but we've got 3 weeks for another game. Yawn. Oh, don't you worry - we'll be having watch parties, DUH! We'll be sending y'all an invite to a watch party this Saturday at Rock n Bowl very soon so stay tuned, folks!! Road trip, anyone??? I'm currently planning on taking a drive to Houston for our November 8th game against UH. Anyone interested? I think we're considering making this a Gumby Outing? I wanted to give a good ole greenie shout out to 2 of my favorite people: Libby Creim and Jeff Darling.... Libby wasn't with the original Mobile-trip-taking-gsapc-planning krewe, but she has become such a huge part to the GSAPC leadership krewe. Everyone sporting a Gumby shirt or koozie should thank her, because I'm not sure that would have ever happened without her. She is taking this club to a new level... and she even humors me when I've had just the right about of bud light to put me into a loud-voice-telling-you-my-life-story mood. She keeps me sane on game days. Plus, I mean, damn, that red hair. How can you not love her? Jeff (far left) being a leader, as usual. And Jeff, I gottta say I'm proud of this kid. I laugh about how I try to keep him organized, and I do turn my head a little at some of the spreadsheets him and AB come up with on our google drive. I have a bad habit of wanting to reorganize all of their documents, but that's just a minor fault ;) Jeff has done SO much to make GSPAC happen. It would never have existed with out him... and he's doing this WHILE getting his PhD in neuroscience. I may bicker with him on the regular but I have so much respect for him as a president. JDar, stop blushing, and please don't mention this sentimental moment we are virtually having. Bottom line: GSAPC is awesome. Tulane football is getting there. My FF teams are winning (just wanted to throw that in there) I LOVE YULMAN. And life... is good. Cheers, see y'all on game day.